This is a really fun recipe because you get a bunch of flavors of muffin out of one recipe. The muffins are also made for freezing, so you can stash a big bag in your freezer and thaw just a few at a time when you're ready for them. Alternately, they'd be fun to make for a potluck or brunch party since everyone can have their favorite flavor. I made chocolate chunk, cranberry + lemon zest, blueberry, and jam + coconut flakes, but really the sky is the limit! Your choice of mix-ins such as blueberries, cranberries, chocolate chips, jam, dried fruit, coconut flakes, cinnamon chips, raspberries, etc. 1. Preheat the oven to 350 degrees. Line two muffin tins with paper liners. 2. Whisk together the whole wheat flour, all purpose flour, sugar, baking powder, baking soda, and salt in a large bowl. 3. In a small bowl, whisk together the milk, oil, yogurt, eggs, and vanilla. Pour into the bowl with the dry ingredients and stir with a rubber spatula until just combined -- be careful not to overmix. 4. If you'd like to make just one kind of muffin, add about 1-1/2 cups total of your chosen mix-ins. Otherwise, divide the batter in half. Fill the muffin tins about halfway full, and then add in a few berries, chocolate chips, or other mix-ins, or a small spoonful of jam. Then top with the remaining batter, and add a few more of your mix-ins on top, either keeping the muffins consistent or topping them with something different...your choice! 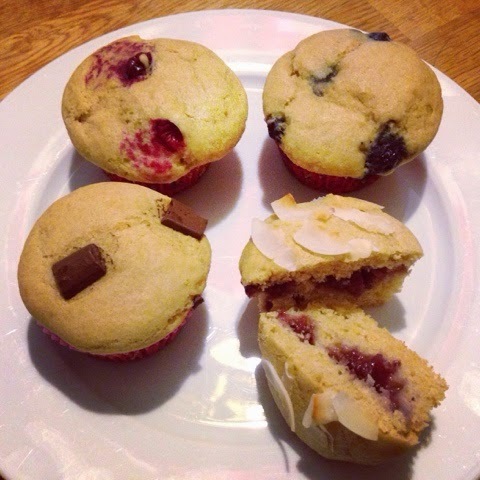 I made blueberry muffins, chocolate chip muffins, cranberry muffins, and jam-filled muffins topped with coconut flakes. 5. Enjoy warm! Or, when the muffins are fully cooled, stash them in the freezer for quick and easy breakfasts. Place in a single layer on a baking sheet, and freeze until just hard. Then pack in gallon-sized freezer bags, removing as much air as possible before sealing the bag. Thaw at room temperature overnight when ready to eat.